Ten months ago, Rudy Parris was approached by a member of his church with a message from the Bible. “Delight yourself in the Lord and he will give you the desires of your heart (Psalm 37:4),” the man said. He told Parris that since he had started to follow God his life was about to change. At the time, Parris didn’t think much about the phrase other than kind words from a fellow Christian. But after last weeks’ whirlwind media blitz following his success on NBC’s The Voice, Parris now considers the man to be a prophet. Parris made his national television debut on Oct. 1 during the final round of blind auditions for the vocal talent show. His stirring performance of the Police’s “Every Breath You Take” turned the chairs of Blake Shelton and Cee Lo Green and turned viewers’ heads across the nation. Parris said a small bit of nervousness coupled with the immense energy of being on stage was something he had not experienced before that night and made the performance less what he is capable of. But you wouldn’t know it by the response of endless waves of new fans. Last week, his rendition cracked the Top 20 on iTunes Rock Chart and had climbed to No. 15 as of press time. On his Facebook page, Parris is asking fans to share the iTunes link to his rendition of “Every Breath You Take” on The Voice to help him rise up the charts. “It is a huge honor to be ranked higher than the Police’s version of their own song,” Parris said. He hasn’t slept much since the show aired, doing non-stop interviews and replying to fans across the social media platform through texting, Twitter, Facebook, his website, etc. Last Thursday Parris attended a Dwight Yoakam concert in Lemoore and said girls were screaming his name, guys were shaking his hands and every few feet someone asked to take their picture with him. Parris said his backstory, age, style of music and his look have combined to create his newfound celebrity. Parris’ success on The Voice and iTunes is astounding for someone who never wanted to sing. “I just wanted to play guitar and never really even thought about singing,” Parris said. Parris did not come from musical parents, but his family did have roots in music. His grandfather, Frank Alvarez, played in an orchestra in Kansas and New Mexico. Locals will better remember his second cousins, Ralph and Manny Alvarez, whose group The Spirals were making a name for themselves in the Valley throughout the 1950s, 60s and 70s. “At one time, Manny owned Sierra Recording, which was one of the only studios in the Valley,” Parris said. Parris first foray into music was playing the violin. A few years later he picked up the electric guitar and instantly fell in love. He and three friends started a band and at 16 years old played his first backyard party for a few hundred people. The playlist consisted of a lot of Iron Maiden and heavy metal. At the age of 18, Parris joined a band out of Farmersville called the Summer Breeze. But in order to work as a paid musician, he had to learn 50 country songs in two days. “That was really the first time I started to play country music,” Parris said. It was country music that changed Parris’ mind about singing. More specifically it was the rugged baritone of Merle Haggard when he heard it on the radio. Parris began to gravitate to the Bakersfield Sound, a style of country music hallmarked by Haggard and Buck Owens. Parris’ talent, skill and interest in the style caught the attention of Owens himself, who invited Parris to play at his Crystal Palace in Bakersfield for eight years. During his residency in Bakersfield, Parris played with the likes of Tracy Byrd, Brad Paisley, Keith Urban and many others. His time with Owens opened up an opportunity to play guitar on tour with Hank Williams III in 2003. The next year, he was sharing a stage at OzFest with his guitar heroes of his youth from Judas Priest to Pantera. “It was a chance to get on stage, get paid, see the world and rub elbows with all of my idols,” he said. Despite his success, Parris had essentially given up on his dreams of a career in music two years ago. He shared his story on The Voice, telling the judges how he sacrificed moving to the music scenes in LA or San Francisco in order to be near his daughter Whitney. As the stress of being a working musician in the Valley got to him, Parris said he actually developed a heart condition and had to stop playing music. Without his life’s passion, Parris said he started attending church to find answers. Rudy said he is feeling better than ever, has a newfound spirituality and is ready to be the torchbearer for the Valley’s musical roots. He also has his daughter’s blessing to pursue a musical career. Whitney, now 22 years old, is a parent herself, appearing backstage on the show with her 8-month old son Easton. 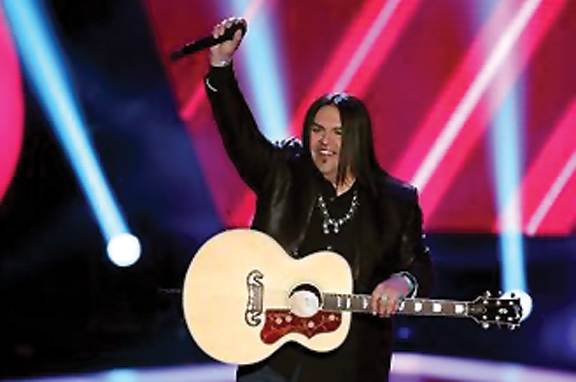 Since the show’s airing and announcement he will be part of Season 3 of The Voice, Parris has returned to his Valley roots and is playing in his own backyard. On Friday, Parris made a special appearance to play a few acoustical numbers at “Concert for a Cause: Everyone Against Hunger” behind the KJUG studio in Visalia. On Oct. 19, he will play at Buck Owens’ Crystal Palace in Bakersfield. Parris will be officially welcomed home on Oct. 27 with a 8 p.m. concert at the Cellar Door in Visalia. Tickets are $10 and can be purchased at the Cellar Door or online at ticketweb.com. To follow Rudy Parris throughout Season 3, check out Facebook.com/rudyparrismusic, follow him on Twitter @RudyParris or visit www.rudyparris.com.